The future of microCHP is a bright one. Leading US companies in the microCHP sector have set out a bold strategic vision for the role microCHP systems will play in the economy. Many industry professionals feel it is likely to be a key component of an emerging 'smarter energy' environment and this theory has been echoed in a recent report produced by Ecuity Consulting LLP. The report sets out how this emerging family of technologies could revolutionise home heating and gives suggestions for a support framework to allow consumers who have a heating system that also powers their house, be rewarded for the full value they bring to the nation’s ailing energy system. One of the key benefits that microCHP systems help deliver, is to relieve the pressure on the national grid and bridge the gap created by our ever-growing energy requirements. The support framework that is required to bring this technology to the mass market is increasing rapidly. Japan is leading the microCHP deployment race, spurred on by its current 'energy crisis' directly linked to the drastic reduction in its nuclear generation capacity. Their government has backed a 'visionary' scheme to put microCHP boiler units in over 30,000 homes, which has led to a 25% energy unit price reduction between 2010 and 2012. Similar cost reductions could be expected in the US if we adopted the same strategy. This means that support for microCHP boiler units, when combined with rapidly falling production costs, now makes economic sense. Sales of future mCHP units will be dramatically increased if assisted by governments at all levels. Fuel cells for microCHP - The future? It’s been said that ‘fuel cell’ microCHP technology is the future of domestic carbon emission depletion, but on a wider scale, fuel cell technology has a huge range of potential applications. The fuel cell itself will not just be used in home heating and power generation; we may soon find ourselves using fuel cell technology to generate electrical power for industry, fleet, public transport and even portable electronic devices. Fuel cells continue to receive far more patents than other renewable energy technologies. Everything from mobile phones to airplanes can adopt fuel cell technology to fulfil their energy requirements. Innovation in fuel cell technology has led to a worldwide race to commercialise the technology in general. Fuel cell technology is now, where solar power was in 1992, taking advantage of niche markets (e.g. forklifts) to leverage the technology, build the infrastructure to support it and inevitably lower production costs. Fuel cell technology is receiving a huge amount of support and attention to enable it to address the wholesale depletion of the world’s natural resources and in-part start to address the issues of global warming and the greenhouse effect. The premise is that fuel cells can offer greater operating efficiency with lower emissions over current conventional power sources and they help us move away from utilising non-renewable natural resources. All fuel cells have the same basic configuration; much like a battery they convert chemical energy into electrical energy and heat but they cannot store it. They can operate using many different hydrogen-rich combinations of fuels such as diesel, methanol, hydrogen or chlorine combined with oxygen or other oxidants to enable operation. This means that renewable fuel sources can be used to create energy via this method. Fuel cells have three main categories of application: transportation, stationary installations and portable uses. Leading car manufacturers are currently researching and developing fuel cell cars that replace petroleum with hydrogen to create power. Honda, Toyota, Hyundai, BMW, GM and Nissan all have development models or 'working fuel cell engines' currently under production. In fact Europe already has 85 hydrogen fuel stations for these vehicles. If a vehicle is powered by pure hydrogen then the only emission/by-product will be heat and water. Zero-emission vehicle (ZEV) programs that support battery and fuel cell solutions are gathering momentum with governments across the globe. As an example, governors of many major American states have agreed to a collective target of having at least 3.3 million zero-emission vehicles on the road in their states by 2025 and to work together to establish a fuelling infrastructure that will adequately support this number of vehicles. The stumbling block is finding the financial backing, taking into account the vast capital it will require to build the infrastructure needed for this wide scale implementation. More information on fuel cell vehicles can be found here www.fueleconomy.gov. 150,000 Fuel cell vehicles on our streets could save up to 75 million gallons of petrol a year and 2.4 million barrels of oil. They would also save up to 12 million tons of CO2 emissions during their lifetime. Stationary fuel cells are the largest and most powerful fuel cells in use today. They are designed to provide a clean, reliable source of on-site power to hospitals, hotels, airports, military bases, schools and homes. They are being implemented on an exponential scale, helping to lower CO2 emissions across the world. Fuel cells can power almost any portable device that uses batteries. 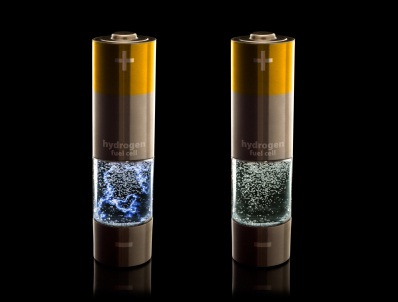 Unlike a typical battery that eventually dies, a fuel cell continues to produce energy as long as fuel and oxidant are supplied. Laptop computers, mobile phones even hearing aids could in the future be powered by portable fuel cells.